Dropped for me from a random mob in Storm Peaks yesterday. Looks like this along with all the other emotion food recipes will be world drops. As such they'll probably go for quite a bit like the Savory Deviate Delight. As such they'll probably go for quite a bit like the Savory Deviate Delight. Unlikely, since they are bind-on-pickup. I fished this item up from a crate out of a Borean Man O' War pool. A very interesting point to note. Last night when I was running "The Nexus" (wing: The Nexus) this recipe dropped from a random mob. What was interesting about this was the fact that it was only lootable by those in the group who had a specific cooking skill. I'm currently sitting at a skill of 273, and of the five members running only 2 were able to roll on it. Can anyone else who has looted this confirm whether a specific cooking skill level is required in order to loot? This seems to be the hardest recipe to get. The other 3 seem to have a higher drop rate. Seems that only those with high enough cooking can roll on these. Dropped on normal nexus, I have 325 skill so i am able 2 get to 350. And i was able 2 roll, but no1 else wasn't. That's coz of master cooking. Got mine from a Valkyrion Aspirant in Storm Peaks. The following is the question in greater..well...much greater, what can I say, while sitting here during a munchie-fest I got quite interested in the mystery of the elusiveness of the haunted herring. The "green vernacular" has caused me greater interest in much less interesting things than this before, I'm quite sure, so oh well. Here's what I've posted on the other recipes..
My cooking skill is 432 and I totally forgot about these recipes. I ended up getting all four of them in a little under an hour in Kaskala, Borean Tundra. I simply killed the Kvaldir Raiders as they came off the boats. Just got this from Yorus the flesh harvester. Got it after 40-something kills. Less than an hour. Good thing is he respwans on top of you so it was easy. Just stand in the middle and wait for him. But after farming Luthion the Vile for 1,5 hour, I've got it! i got one from one of the flame guys in voa 25. cant remember the name. maybe someone will reply to this one with it. i looked and couldnt find it on the drop list. does anyone have a suggestion of how to get these at level 85? It seems that floating around in the Borean Tundra is a good start. Questing there with my girlfriend, she accidentally attacked Bane, a 70 elite, and he dropped this recipe, so she is very happy now. Well... scared, I guess. FWIW, I've farmed the Kvaldir Raiders in Kaskala successfully for this recipe previously but recently farmed them for over an hour with no success. Looking at the "Dropped By" list, Kvaldir Raiders doesn't appear. Several of the 'usual' sites and mobs we used to farm for mats no longer seem to be valid (e.g. Frostweave Cloth from mobs that spawned by the big giant lady in Scholazar Basin comes to mind). What the..? I SWEAR I don't remember getting this recipe, but I just typed in "Herring" so I could cook more for The Northrend Gourmet and it popped up! As a level 85 with max cooking, I can say the Haunted Herring recipe DOES still drop! Finally! I got it tonight from one of the Kaskala Raiders. I've been working on this for about a week now. Very excited to have my Chef title finally. Thanks Ciane! At cooking level 525, it dropped in 30 minutes. I am now officially a Chef! Dropped off a Kvaldir Raider on the island of Kaskala, Borean Tundra. I've been farming Converted Hero mobs with no luck. I try for a couple of hours almost every day. I HATE this recipe! I did the Kungaloosh quest track for that recipe, and it wasn't bad. This has the worst drop rate ever! And as soon as I write about it here, it drops on the 2nd mobs of Converted Heroes. Argh! Finally! I got this after about 2 hours of farming, from a Minion of Kaw at 53,24 Borean Tundra. For all you chefs still looking for this or any of the emotion foods, I highly recommend the Kaskala area in Borean Tundra as stated in the other comment. I needed recipes for Haunted Herring and Bad Clams, and after 10 min of farming the raiders I had both. This is by far the best way to obtain the achieve. This was done on an 85 with 528 cooking. Just dropped from a random trash mob in ICC10 normal while I was soloing it. 2014-11-11 - 6:10pm CST. 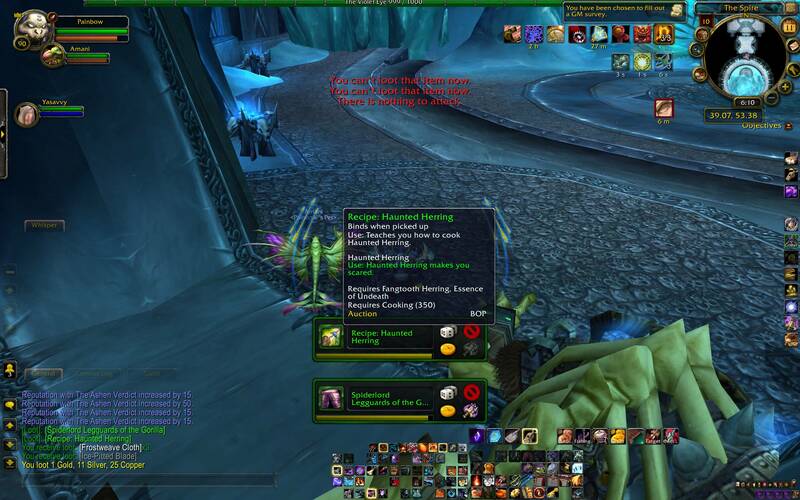 Just had this drop from a "Banshee Soulclaimer" in the Dead Fields in Zul'Drak. Use: Teaches you how to cook Haunted Herring. Use: Haunted Herring makes you scared.